- Fashion Ecstasy on 五月 18, 2016. Please don’t think I’ve lost my marbles when I say that now is the perfect time to begin your Christmas preparations. I’m not suggesting you leap into the loft in search of your decorations, nor should you start hanging garlands from the fireplace, but there are things you could be doing right now which will make Christmas a stress-free affair. Don’t worry! I am not referring to decorating of the Christmas variety just yet, but if you have any rooms that are in desperate need of a lick of paint, or a few rolls of wallpaper, then the sooner you do it, the better. It is common for people to get the urge to redecorate their homes in the run-up to Christmas and then discover they simply do not have the time to do it. This is why the summer months are the ideal time to don your overalls and get your home re-styled exactly how you want it. It will also not smell of paint by the time Christmas comes but will still have a fresh feel about it. If your bed isn’t as comfortable as it should be, or you are concerned that your child’s bed is keeping them awake at night, make sure the family are well and truly asleep when Santa visits by purchasing new bed frames and mattresses for your home. Rather than waiting for Christmas, when the shops will be a flurry of people desperate to get their homes in shape before the big day, buying your bed now is a the wisest choice. Online stores like Bedstar can help when looking ahead to Christmas, as you can purchase a new bed via their website rather than traipsing around the shops with the family in tow. Of course, getting rid of unwanted possessions and furniture is a great idea all year round, but this is not specifically what I mean when I say have a clear out. I am suggesting that you clear a space specifically for gifts – a space that is high enough or hidden to keep put the prying eyes of children (or nosey partners). This space could be inside a wardrobe, under the stairs, or in an inbuilt cupboard and should be kept clear, specifically for Christmas presents. By allocating just one space to gifts, rather than keeping them in various places around the home, you are less likely to misplace them, only to discover them long after Christmas has passed. If you think having an entire cupboard just for Christmas is extravagant, bear in mind that some people actually have a whole room dedicated to wrapping. We all plan to be super organised, but no matter how many lists you make, I bet you always forget one or two people only to suddenly remember when they turn up at your door bearing gifts. Err on the side of caution and purchase, or make a few gifts that could be given to anyone, so that if you do forget, you have a backup plan. 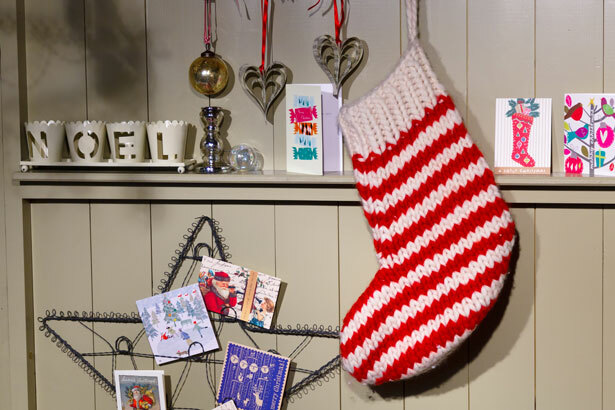 You can keep these gifts in your gift cupboard along with wrapping paper and sticky tape so they can be easily retrieved and wrapped when you are caught on the hop.